A while back I came across a very dated jewelry box at the thrift shop, it was only $3.99, so I scooped it up. When paint was the theme for So You Think You’re Crafty last week I decided to dig it out of the ‘needs makeover’ pile and give is a breath of fresh air! A little paint went a long way, updating this little 80’s Jewelry box. 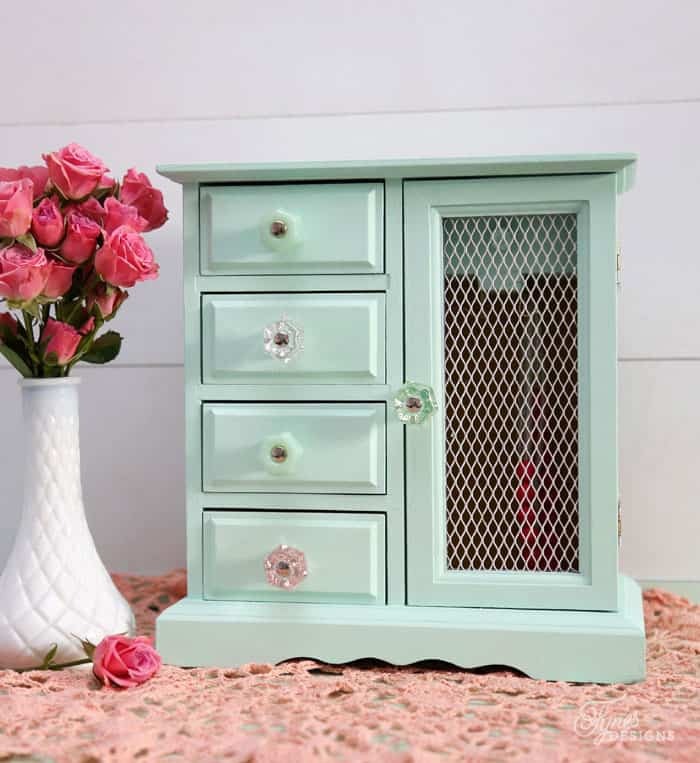 I mixed one of my favourite colors (Voice of Color Wintergreen Mint PPG1229-2) with a bit of BB Frosche Chalk Paint Powder, and within a few minutes, I had updated this drab chest. I would have stuck with the original hardware and just spray painted them, however one handle was missing. Luckily I had some sweet glass knobs from D. Lawless Hardware on hand that suited the makeover perfect! I was honestly worried they would be too big, but they worked great, and the fact they were all mismatched, gave it a unique touch. I was a bit concerned about the yellow velvet lining inside, but I think it works with the rest of the colors. This little jewlry box is perfect for my daughters treasures, she has something in every drawer! It even has a music box, that plays a sweet melody! 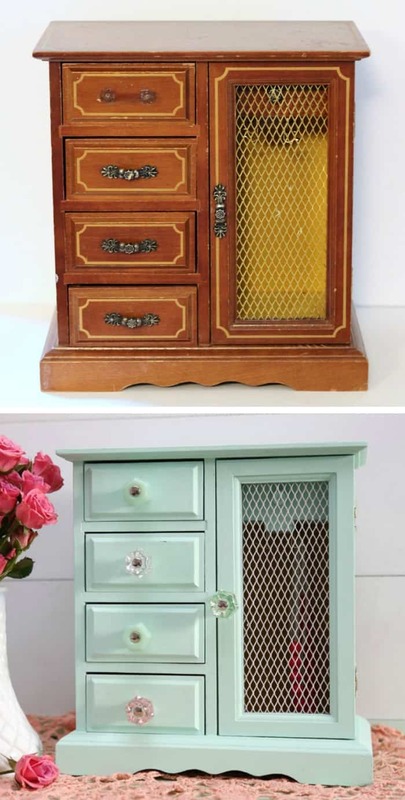 Isn’t this a cute makeover project, and you can certainly complete it in only a few hours. Be sure to follow along with the So You Think You’re Crafty Competition, great crafts, and awesome contests each week! really sweet, love those knobs! thanks for sharing on craft schooling Sunday, the party is even more wonderful with your added creativity! It looks beautiful in mint, and the hardware really makes it. I’m sure your daughter loves it. I’m thinking maybe my daughter’s jewelry box needs a makeover. She does love it! The hardware is great! What a fabulous before and after! I love aqua, such a beautiful color! This post instantly took out to me when I saw it at The Creative Corner Link Up Party. I’m a new host over there 🙂 Can’t wait to see what other fabulousness you share with us this Sunday! I really love the jewelry box now. The colour is so neat, and the hardware is cool being mismatched. What a great makeover- huge improvement! And I love, love, love that color. 🙂 Thank you for linking up at Snickerdoodle Sunday- hope to see you again later today. It really did look beat up and now it looks brand new! 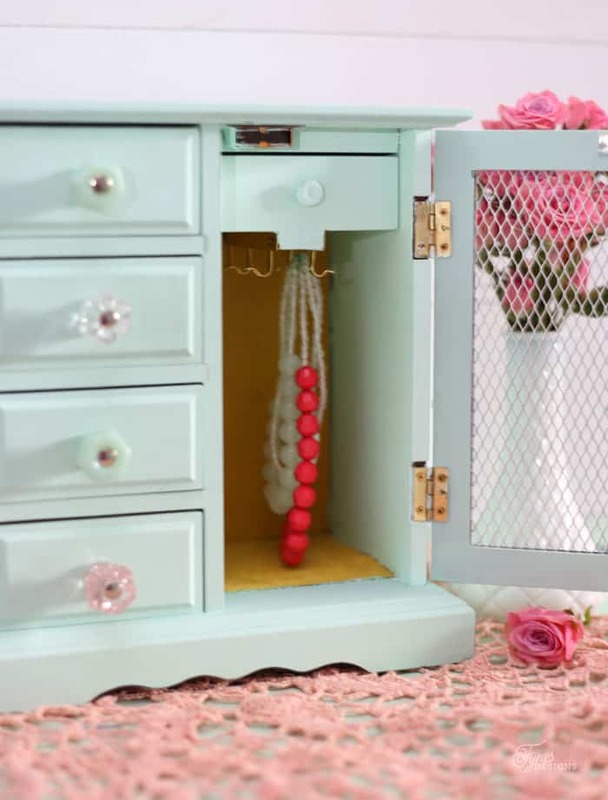 I bet your daughter loves to stash her treasures in this little jewellery box. What an absolutely lovely dresser! I love the finish, the color and the knobs. So cute!! Thanks so much for linking up with us at the Best of the Blogosphere. We’d love to have you back again tomorrow! This is such a sweet makeover! I think a princess of any age would love to have one! Thanks for sharing it on Throwback Thursdays! What a transformation! And I LOVE the paint color that you chose! 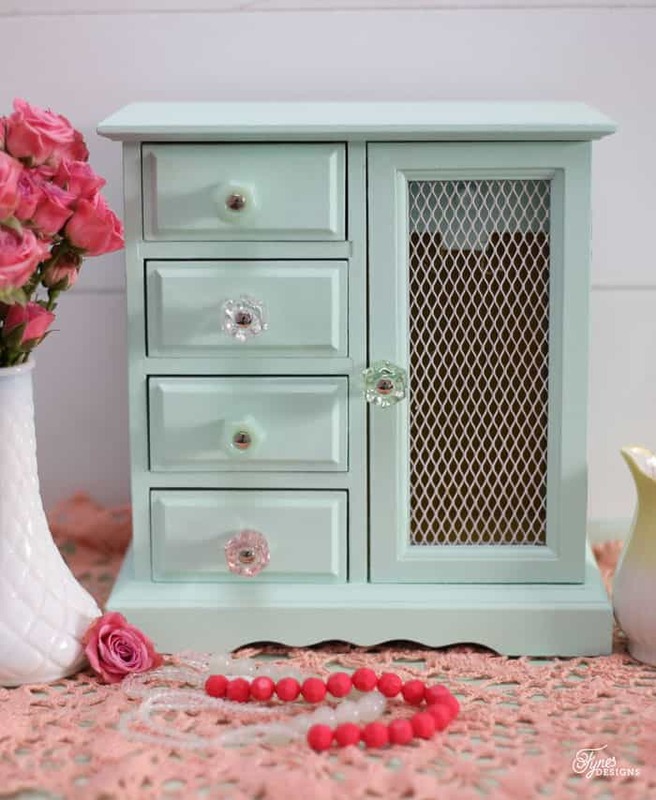 I found this EXACT same jewelry box, and bought it just to repaint it! I made mine navy to pop with the yellow inside, but I love this mint green!! It turned out amazing. I love the new knobs too- I spray painted mine! And ended up buying a second matching box later, that I plan on painting as well. Sounds so pretty! So many of these little gems hanging around! I was wondering if you knew the size of the knobs? I’m currently re doing a Jewelry box for my little sister but can’t seem to find anything, so I was thinking of ordering from the store you mentioned you got them from, but still have no idea what size I would need. Thank you! The ones I have a not too bulky. The end of the knob is about the size of a nickle. How did you change the knobs with the velvet inside? Did you have to tear it out? 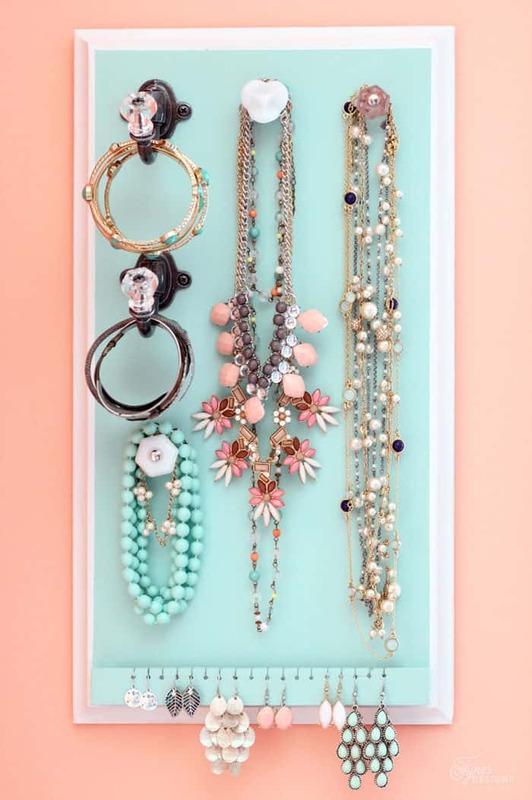 Hi, We just bought a similar jewelry box at Goodwill. Did you sand it first? We are absolute beginners on how to refinish wood. Are there any sites or tutorials you recommend for beginners? 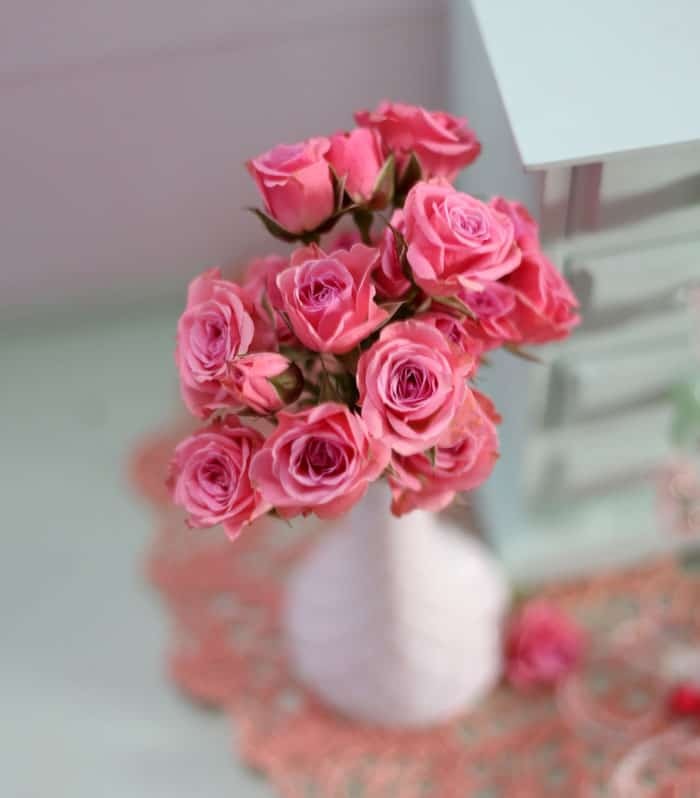 Yours is so beautiful!